Inspired by the iPhone’s Notes.app, the Notepad is a modern WordPress theme with a subtle touch of the sketchy effect. Key features include: multi-level dropdown menus, social media buttons, threaded & paged comments, and widget support. 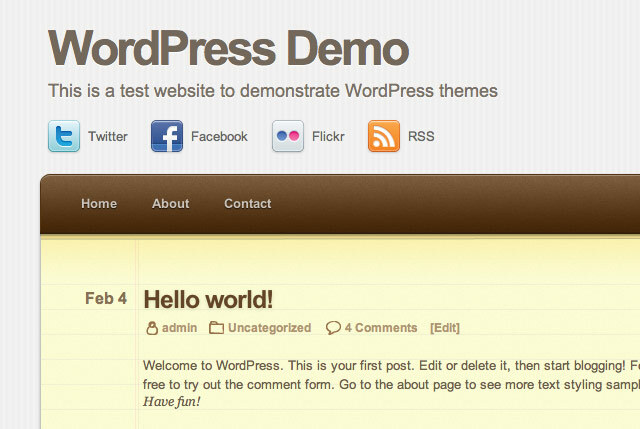 It has been tested on WordPress 2.9 with Firefox, Chrome, Safari, and IE7+. This theme is released under GPL. It is free to use for any purpose. Keeping the credit links in the footer is appreciated (optional). The main content area is 520px and sidebar is 270px. Users with a CSS3 compatible browser will see the visual enhancement such as rounded corners and drop shadow. Added theme options (coded by Jon Raasch). All strings in the theme files are replaced with l10n. The post date was hard coded in the initial release. It is fixed now. Please download the latest zip file. The theme includes an option page where you can: add custom favicon, exclude page(s), disable dropdown, edit or disable social media buttons, and add footer tracking code. If you want to customize the design, a copy of Notepad PSD is available for download. For your reference, the following image illustrates the main components of the theme. Don’t forget to check out my premium themes at Themify. The themes come with a framework and numbers of custom widgets. With the framework, you can customizing everything from setting to CSS styling without any coding skills.